It was an eventful weekend for UT soccer as both the men and women competed in the Sunshine State Conference (SSC) championship tournament. With the women playing in three games and the men playing in two this past week, it was a busy and grueling time for both teams. With the championship and their respective seasons on the line, both teams headed out on the road in search for the championship trophy. 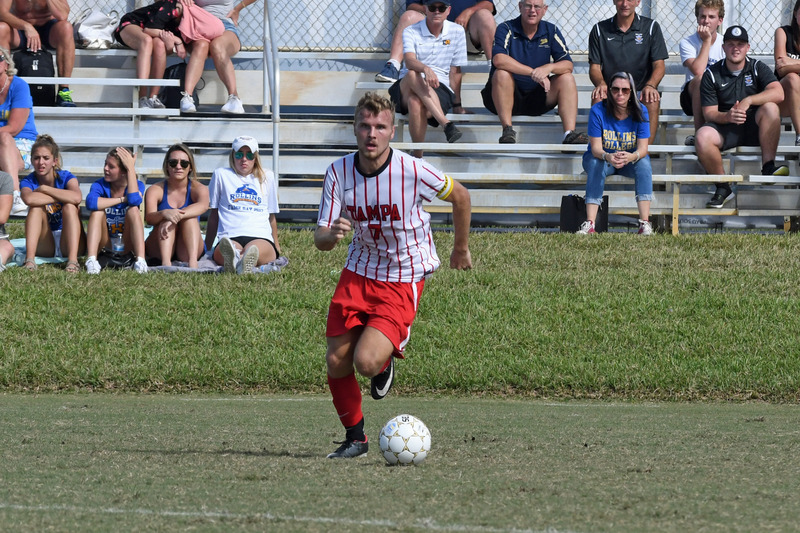 Before the men could think about the championship game on Sunday, they had to get through Lynn University in the Semifinals. After a hard fought 90 minutes of scoreless regulation play, the Spartans and Fighting Knights headed into overtime in the hopes of propelling their team into the championship game. After two full overtimes and a total of 110 minutes played, the game was decided by a shootout that stamped UT’s ticket into the final. Goaltender Jake Richards was the hero of the game, ending the shootout with a score of 4-2. Riding high off their dramatic win on Friday, the men headed into the championship game on Sunday ready to extend their season and win the trophy. Facing off against Rollins College, the Spartans got the result they were hoping for with a 2-1 victory. Scoreless up until the 55th minute, Felipe Desousa put the Spartans on the board. Protecting the lead, the Spartans were forced to attack once again as the Tars evened the score late in the 80th minute. With the Spartan’s goalie playing the role of the hero in the Semifinals, Marcel Salokat took that title in the championship game, scoring to put the game away in the final minute of regulation. With the SCC Championship in the bag, the Spartans will shift their focus to the upcoming National College Athletic Association South Regional tournament. The women had a grueling week. Playing in three tournament games throughout the week, the women had quite the challenge on their hands. Unlike the men, who had a bye through the quarterfinals, the ladies took on Eckerd College on Wednesday. Winning 1-0 in overtime, the team moved on to the Semifinals thanks to Lacy Nasello in the 99th minute. Luckily for the Spartans, the Semifinal game wasn’t as much of a nail biter as the previous game. Thanks to goals from Ali Robinson, Lacy Nasello and Erika Peitersen and a clean sheet for goaltender Caroline Frykgard, the Spartans defeated top ranked Nova Southeastern 3-0, securing their spot in the championship game on Sunday. Like the men’s Semifinal game, the women played against Florida Tech, through regulation and two overtimes without a goal, forcing a penalty kick shootout. With their season riding on the shootout, the Spartans tried their hardest but were on the losing side of the final score. Losing in the PKs 4-2, the Spartan’s season was concluded while Florida Tech celebrated their championship win. From knocking out top seeded Eckerd, to Frykgard keeping a clean sheet through all three games to the tournament, to Nasello netting two important goals throughout the tournament, there was a lot these women can be proud of. Ending their season, the women walk away with an overall record of 9-6-3 and a percentage of .583. With six seniors graduating this year, the team will have their work cut out for them as they head into a new season next fall without some of their key players. With young talent coming up through the team and the experience of a playoff run this season, the Spartans should have another successful season ahead of them. Both the men and the women’s sides have a lot to be proud of. Both made it to the SCC Championship game, which isn’t something to be taken lightly. As the men continue their season and their pursuit for more titles this year, they will need all the support they can get in order to make the school proud of UT Soccer.